Travel and Leisure says: "Donna Thomas has explored many corners of North and South Islands in search of hidden gems. She can help birdwatchers see the endangered yellow-eyed penguin or send avid trekkers on guided hikes to secret waterfalls in Paparoa National Park." Grasmere Lodge — High Country Retreat — where luxury and natural splendour come together in the heart of the Southern Alps of the South Island of New Zealand, to form what one international guest described as “a whole other world of peacefulness & serenity.” Built in 1858, the original limestone homestead, now the core of the lodge, introduces you to the style of personal pampering that earned the Harper’s Hideaway Report Grand Award in 1998. At the same time this traditional New Zealand high country station (ranch), set amid towering 7000 ft peaks, provides a wide range of outdoor activities for those seeking a more adventurous interlude. 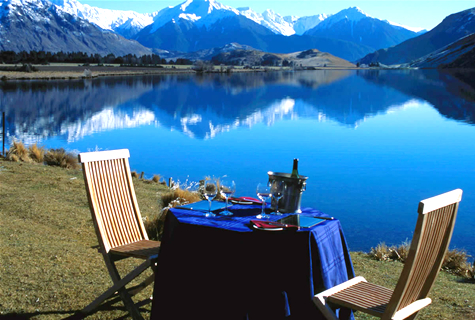 Grasmere Lodge also offers a richness of traditional New Zealand hospitality. Owners, Oliver and Vicki Newbegin, and their staff epitomise New Zealand friendliness and generosity of spirit. Together they take great delight in sharing the magic of Grasmere with their guests. The large comfortable lounge opens out into the garden for al fresco hors d’oeuvres in summer, and large open log fireplaces in the original stone ensure cosiness on colder days and where the five-course gourmet dinner is usually served. One of the oldest rooms has been turned into the Mountain Spa, offering indulgent pampering and therapeutic massages. Breakfast and lunch are usually served in the Verandah restaurant, taking full advantage of all-day sun and great views. The lounge is perfect for chatting with other guests over afternoon tea, or finding a quiet corner and a good book on the mezzanine. Feel free to stay in practice at the grand piano, or to stay in touch with home with the complimentary internet access. The Chalet is a short walk from the Homestead, set amongst well-established pine trees for shelter, with stunning views of the surrounding mountains. It is built in a Colorado alpine style, clad in cedar with copper spouting. Each junior suite can be booked individually and has separate outside access. Alternatively, a central lounge or Great Room measuring 54 square metres (580 square feet) can be combined with one or both downstairs rooms. The lounge has an eight-metre (26 feet) high beamed ceiling, with leather sofas seating eight, arranged in front of the huge log fireplace of stunning South Island West Coast schist. Internal access to the lounge is available if the upstairs rooms are booked by the same party. New in 2004, the Riverview Cottage has enormous windows to take full advantage of its sweeping views down the Cass River and across to the Puketeraki Range - the heart of the Arthur’s Pass National Park. It is built to fit in with the surrounding environment in a modern alpine style. It features two junior suite bedrooms of 51 square metres (550 sq ft), each with their own gas fireplace, with walk-through wardrobes, separate toilets, and spacious bathrooms with individual vanities and jacuzzi baths. In addition, both rooms have a king or twin single beds, comfortable armchairs, antique desks, internet port, and a deck with outdoor chairs and table. With a full lounge between the two junior suite bedrooms, this can be taken by one couple that enjoys space and privacy, or is perfect for two couples or a family. The 12-metre (39 feet) pool is heated to 26 degrees Celsius (80 degrees Fahrenheit) and has teak loungers around it for you to take full advantage of fine weather. Sunscreen is essential because of the clean mountain air and the hole in the Antarctic ozone layer. Breezes in the afternoon are deceptively cool and you may not realise how strong the sunlight is. Owner Oliver Newbegin has long been a fan of Porsche cars and has owned more than 30 over the past 30 years. Currently he has a 1958 356 Speedster, a 1973 911 Carrera RST, a 1973 914 and a 1982 911 Turbo. The most recent addition to the collection is a 1964 Porsche Junior tractor with a whopping single cylinder of power. Oli was a founder member of the Porsche Club of New Zealand, vice-president for 15 years, and one of the organisers of the amateur Bridgestone racing series that tours New Zealand tracks each summer. His collection of Porsche posters, trophies and other memorabilia is housed in the Porschehaus, along with David McLeod’s old gig, which was restored on site in 1996 by now-manager Tom Butler. It is fair to say that Grasmere Lodge does have an indefinable quality that isn't replicated anywhere else in New Zealand. By virtue of its dramatic location, its ever-changing climate and its unashamed emphasis on quality and quiet comfort, Grasmere will always be an unparalleled experience. Ready to create your perfect New Zealand Vacation? How amazing is Donna! We used her and her team to plan our honeymoon in Feb 2011. She put together a 2-week driving tour of the South Island, which was simply the best vacation of our lives. What was so terrific was that she listened to our more vaguely described interests (e.g., 'being outside', 'being airborne', 'looking at the sky', 'lots of scenery') and crafted a finely-tuned itinerary that exceeded our desires (e.g. guided/unguided hikes, overnight fjord cruise, observatory night, helicopter-glacier hike, guided fly fishing day, sailing day, etc.) These activities were woven into the driving tour, which put us, gobsmacked, in the middle of the incredible NZ scenery. The activities and driving were perfectly balanced against downtime at a place. We loved the guides she works with (necessary for both the fishing and Routeburn hikes)--they are hilarious, knowledgeable, lovely kiwis. And the B&Bs she booked us into were also terrific--the hosts were enormously friendly, detail-minded, and informative (and made delicious breakfasts! ), and the accommodations were pristine and all overlooked some delightfully gorgeous view. Her day-by-day itinerary, detailed maps/directions, easy accessibility (toll free number from NZ), and intermittent check-ins to our hotels to ensure our safe arrival made us feel cared for and secure. Her associated flight specialist, Jae Dee, was equally attentive: when we were flying post-blizzard and couldn't leave Newark, she booked backup flights and made all kinds of contingency plans, and neither she nor Donna went to bed until they saw our plane had departed! What attention to service. We could not recommend Donna and NZ Travel more highly, and have been insisting that our friends and family use them when they go to NZ themselves. Donna's abilities are superlative, and we plan to return to NZ (and maybe Australia too!) with their guidance. Copyright © 2001-2014 New Zealand Travel. All rights reserved. Photos provided by Chris McLennan, Chris Sisarich, Rob Suisted, Tourism New Zealand, unless otherwise noted.